Our wee cafe wakes up the day with breakfast, followed up by home baking, speciality coffees and great beers or wine. We now specialise in Scottish brews but still source the lovely Belgian fruit beers that everyone enjoyed last summer. Drop in for a breakfast, a light lunch or drink, sit in the garden or watch Crail go by from the coffee shop. Our guesthouse bed and breakfast accommodation offers 3 bedrooms, all on the upper floor of the Honeypot. The Seaview bed room is a twin bed room with stunning views and a private bathroom. Elie is a cosy double bed room with en suite and Crail sleeps up to 3 adults and also features a en suite bathroom. 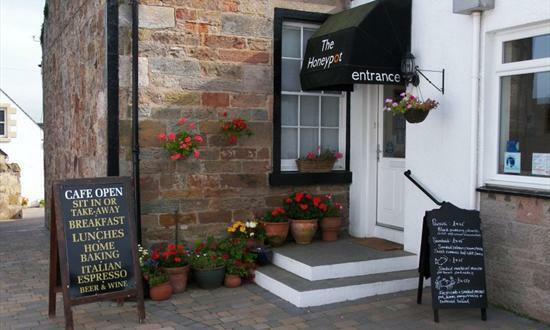 Accommodation at the Honeypot is also ideally placed for those seeking accommodation in St Andrews. Free Wifi Internet is available for our customers.Book a room online now.